The Tidewater Community College Chorus will be performing an original work, titled “Meditation – There is a Solitude of Space” at its spring concerts on April 22 and 24. 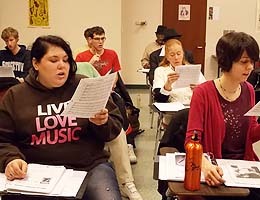 The song was composed for the choir by Bruce Frazier, a professor of commercial and electronic music at Western Carolina University, and founder of the program that has grown to be one of the largest of its kind in the nation. “Meditation” is a madrigal style song set to an Emily Dickinson poem. Carrie Parsons, a first-year student, agrees. “It is amazing to sing a work that is based on a well known poem and to be under the direction of Mr. Warren who brings professionalism to each song we sing,” she says. TCC Chorus celebrates 10 years with the college this year. The choir started with a handful of students and has grown to include almost 30 singers.